Welcome to Basil + Tate’s first ever blog post! I’m so excited to have a space to share this new adventure with you. Transitioning from the world of education to the world of interior design and entrepreneurship has been quite the trip so far. I never dreamed that I could love it as much as I do, but I can’t get enough of it. I love it all! :) So, thanks for being here. I hope this site becomes a place you visit often to learn and be inspired. I’d love to connect with you, so feel free to leave me a note in the comments below! This blog post has dual purposes. I want to finally reveal to you The Nyberg Project that has been nearly a year in the making... plus leave you with some tips on how to pull off a similar look in your own home! 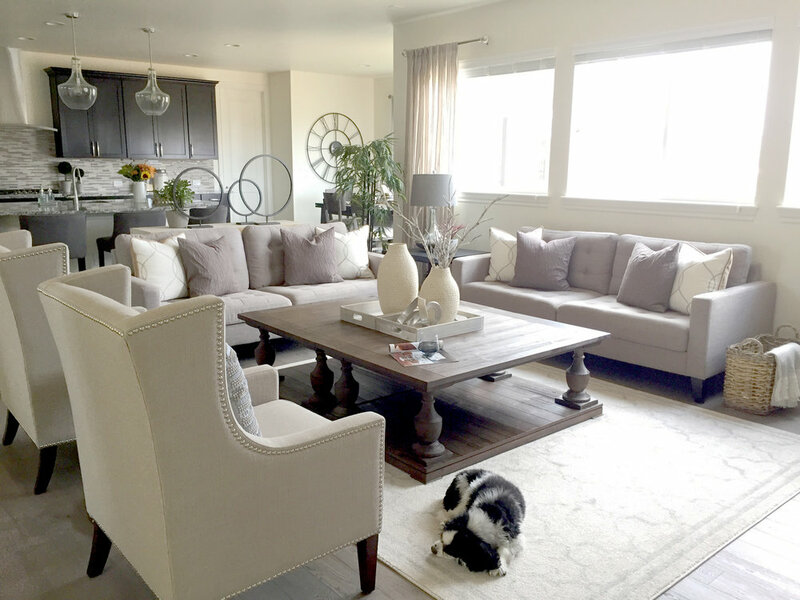 The Nyberg home has an open concept main floor living area, so the decor had to be cohesive and flow from one room to the next. The style of their home isn’t traditional and it isn’t contemporary - it’s transitional - a newer term in decorating that has a pretty distinctive look. Let me reveal this beautiful home to you as I point out 5 of the design 'rules' I intentionally used to pull off this transitional style. The color scheme might be the most obvious characteristic of the transitional style. Or maybe it’s the lack of color that is the most obvious. Transitional decor isn’t necessarily monochromatic, but it’s a blend of neutral tones - browns, blacks, and whites. Another essential element in a transitional design is texture. When all of the pieces are basically tone-on-tone, I had to rely on texture to add contrast instead of color. Throw pillows, rugs, blankets, and curtains are all great ways to add texture and interest to a space. Transitional decor takes more of a minimalistic approach than many other decorating styles. There are lots of clean lines and accessorizing is kept to a minimum. It’s definitely a ‘less is more’ approach, but that requires that the accessories you do pick need to be thoughtful, simple, and sophisticated. 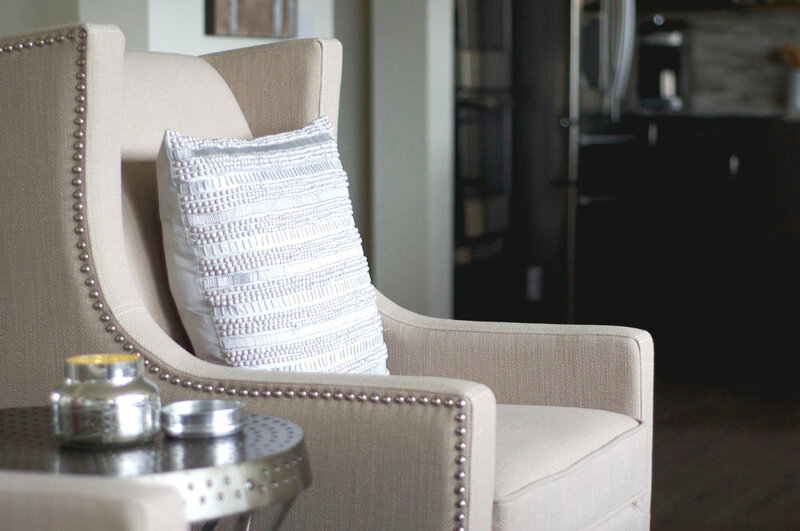 Adding some life to any room is important, but in a transitional room, it’s imperative. Not only do they soften the room up a bit, but the natural greens and whites pop against the other colors in the room. 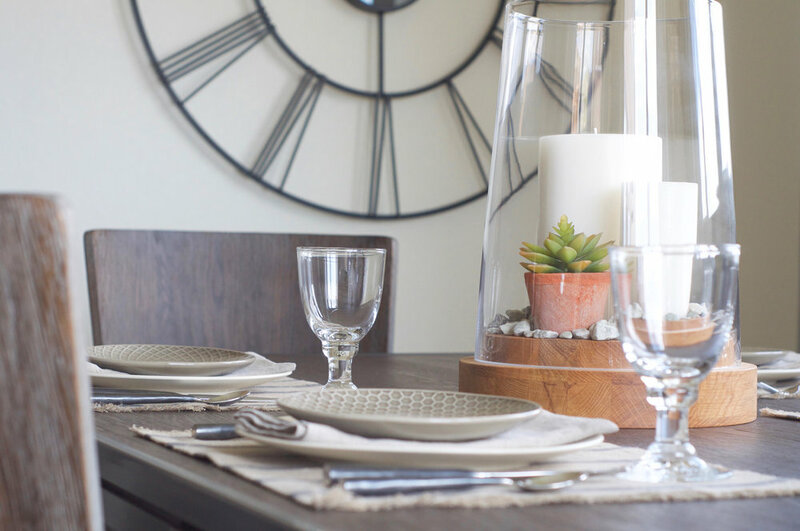 Succulents make great tabletop accessories and artificial (or real!) trees help to fill empty spaces. It is easy to get carried away with clean lines, but it is important to remember to soften up the room, too. For example, when designing the tablescape below, I added some flowers to help contrast with the hard lines of the spikey balls, the metal letters on the wall, and the light fixture. Curtains are another element that instantly soften up a room as well as making a space feel complete. There you have it. Five easy ways to add some transitional style to any room in your house. I don’t really believe that any room is timeless, but I do think a transitional style is about as close as you can get. So, if you're in the market for redecorating and looking for an alternative to traditional decor, this is a look you may want to consider. If you liked the Nyberg Project, stay tuned because there is so much more to come. We just completed their entryway and a giant gallery wall on their staircase. Now we’re working on their guest bedroom and bathroom, their home office, and master bedroom. The fun doesn’t end, and I’m totally fine with that because I *love* decorating this house. Thanks again for checking out the blog! If you haven’t already, I’d love for you to sign up for my newsletter below so you’ll be notified of future blog posts - more project reveals, shopping guides, styling tips, and more!